Tell us a bit about Salvage & Selvedge and the concept behind it. 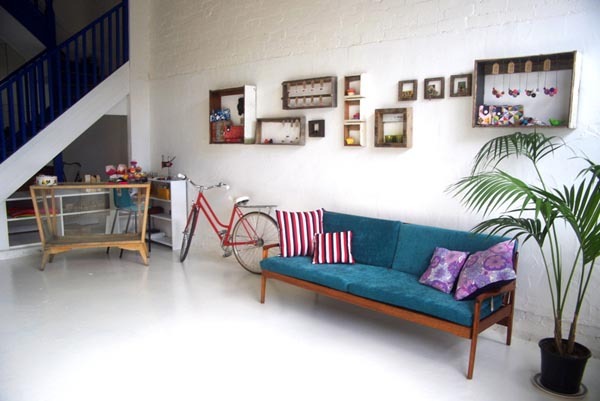 Salvage & Selvedge is a creative retail oasis in the heart of Melbourne’s buzzing Fitzroy. 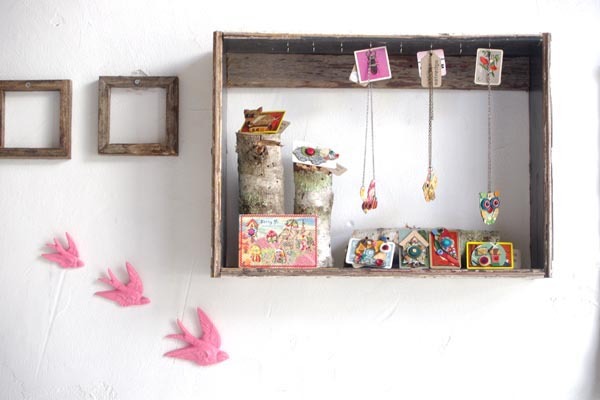 We specialise in jewellery, gifts, homewares, furniture and other fun curio with a strong reclaimed, handmade and local focus. Whilst we either create from scratch or restore many of the products ourselves, we are also proud to act as a venue for local artists and designers to connect with a local customer base. When did you open the doors and what was the motivation? We opened our doors in August this year after several months spent restoring and recreating the dilapidated shell of the beautiful, old, Victorian building that kindly plays host to Salvage and Selvedge. Getting to the opening part alone was a massive task but a befitting start to a proposed venture into retail, recycling and restoration. The biggest motivation for both of us has always been to work for ourselves. Avoiding a 9-5 is paramount, even if it means working longer hours! This combined with the fact that Dean’s apartment was overflowing with half restored furniture and vintage bicycles and Andria’s creative projects were expanding outside the realms of her label, Shagpile, led to something of a leap of faith to turn a longtime dream into reality. 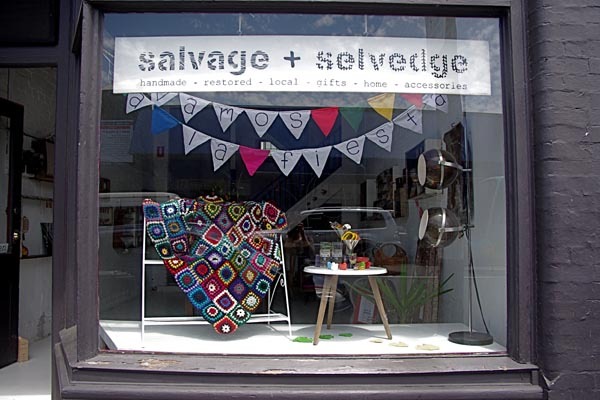 What kind of items can we expect to find at Salvage & Selvedge? You can expect to find a whole range of, clever, quirky or just plain awesome products from some of Melbourne’s most talented emerging and sought after established artists and designers. 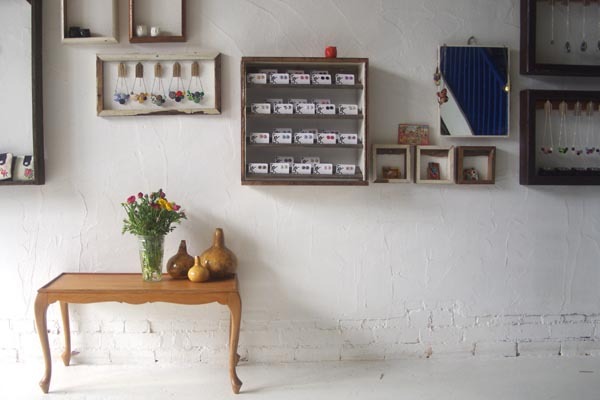 We carefully select affordable, quality handcrafted products and lean towards those with an up-cycled emphasis. 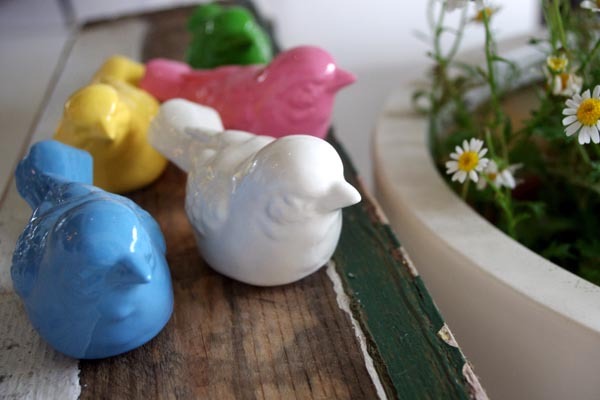 We love nothing more than seeing potential landfill re-purposed for another lifetime of use. Some of our current stock includes re-purposed brick books by Light Reading, sweet ceramic ornaments by Pirdy, beautifully up-cycled beer bottle glasses by Sustainable Stubbies as well as vintage lino goodies by Betty Jo. 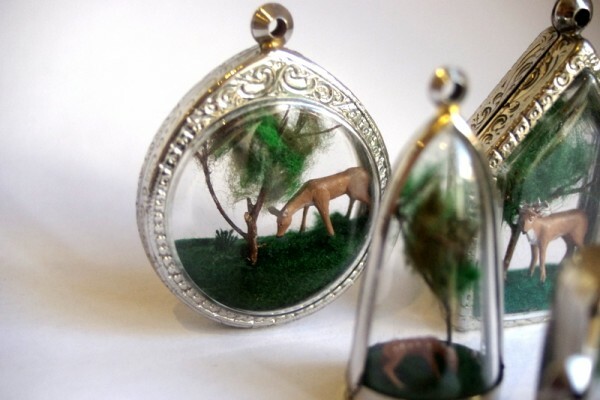 We also stock an abundance of products from Andria’s buttony, textile jewellery label Shagpile. Our displays are also for sale! All of our products are displayed on restored timber tables and in frames made from reclaimed timber all courtesy of resident carpenter Dean. What do you love most about running Salvage & Selvedge? There are so many great things about running Salvage & Selvedge. 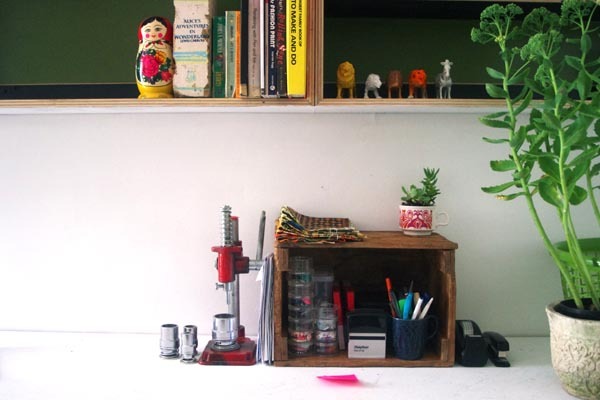 Having a space to craft and retail from in the heart of Fitzroy is a joy in itself! Being able to showcase local products that we love is great and having such a friendly, receptive audience makes it even better. We feel lucky to be involved with so many talented and inspiring people on a day to day basis. When you are not in your shop, what are you usually doing in Fitzroy? We are so lucky to live and work in such a busy, vibrant community. When we aren’t in the shop (which isn’t too often!) we are eating out at one of our favorite restaurants including Vegie Bar and Yong Green Food or enjoying vegan ribs at the Gasometer. We love all the gorgeous old pubs in the backstreets of Fitzroy and The Standard is a regular favorite for a couple of bevvies. There are lots of awesome vintage clothing and bric-a-brac shops around and trawling these is a fave pastime when we do in fact have some time to spare! Who are the team behind Salvage & Selvedge and what are their roles? Dean is our resident Jumble Sailor and carpenter. 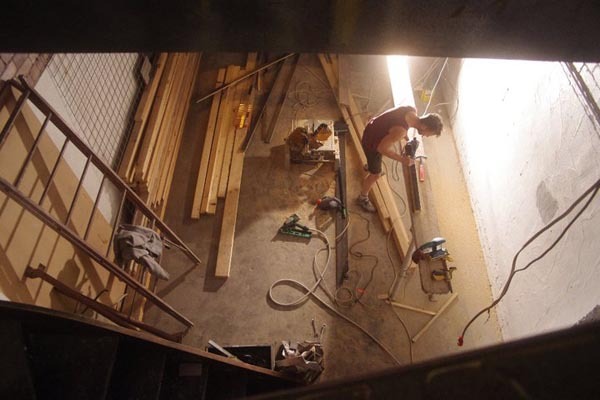 He was responsible for the entire shop restoration and fit out as well as our sensational shop fittings. Dean is passionate about restoring furniture and vintage bikes as well as working with reclaimed timber. If you happen to pop in on a weekend you will also find him in his new role (which he secretly loves) playing shop keeper. Andria is our Head Crafter, responsible for creating the Salvage & Selvedge jewellery range alongside her own label, Shagpile. Between window dressing and product photography she is also the main contact for suppliers and does her best at keeping our books order. What is the hardest part about running a business? To be honest it is all really hard work but as the cliche goes, it is also very rewarding! What new plans or aspirations do you have for 2012? We are looking forward to discovering lots more local artists and designers as well as working on a million and one new product ideas of our own and getting our website up and running. We are also hoping that blending with the scent of handmade soaps in the shop will be the aroma of freshly brewed coffee…. watch this space! Wow, this shop looks great! So beautiful, and what a fantastic ethos. I’ll have to check it out soon. What a magnificent combination to get s sweet little shop running, the carpenter and the crafter, just perfect! The shop looks so sweet, it’s shameful that I have not yet dropped in!